Brew of The Day: SM Accessories Ladies' Month Promo this August Upto 50% OFF! 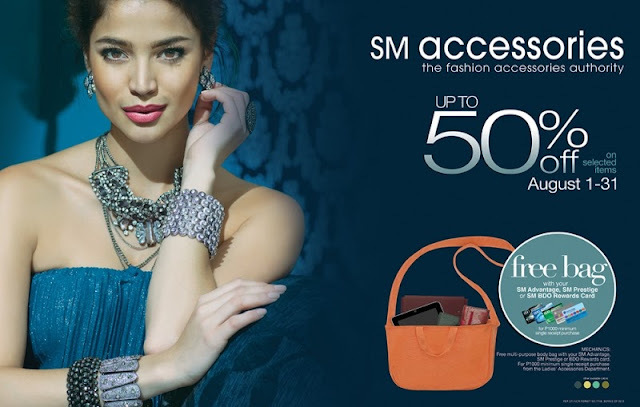 SM Accessories Ladies' Month Promo this August Upto 50% OFF! Hey Coffeeholics! It’s the ladies’ turn to shine this month and we want you to spread the word to all your gal pals! Are you and your BFF fashionistas at heart? This August, the Fashion Authority has plenty in store for all you lovely ladies out there. Yes it's up to 50% OFF on selected items. AND you get a free bag for every P1,000 spent. Its a happy month for us ladies! Yay! Just make sure you present your SM Advantage Card and you are all set. Happy Ladies' Month Coffeeholics! Happy Shopping!